We all know a beautiful frock can be improved with matching accessories and the same can be said for a wedding dress. There you are in your beautiful white gown and what could be finer than having your maids dressed in outfits that not only look fantastic, but can match almost any budget. And if you are looking for something that is a little bit different, dresses that add class and glamour, plus they can be worn again at a variety of events and parties over the coming years, then look no further than Lady V! You’ll find patterns, styles and colours to match almost any theme you could imagine, but don’t take our word for it. Below is a selection of our lovely ladies who have turned their big day into a vibrant feast of colour. Aoife Blight from Penryn who dressed her maids in two different shades of Hepburns. 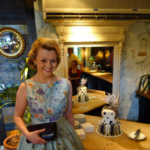 "This photo was taken at my 50's inspired wedding on 26th April this year and we chose your Hepburn dresses and petticoats for my bridesmaids Mel and Ange. (including a red on under my dress) The dresses fitted perfectly, reasonably priced and super comfortable. So thank you Lady V Vintage for being apart of our special day." The polka dot dresses Suzie Flood Kenny from Dublin used when she was tying the knot. Rebekah Wright writes: "Had the best time being bridesmaid for my sister, this is a photo of me (right) & the other bridesmaid (Katie, left) jumping for joy!! As you can see these dresses are striking and the messages brides send us tell about the praise and comments guests give about the outfits. The dresses bring a party atmosphere to your big occasion and also make it look a million dollars. 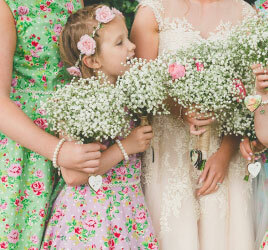 Above are the polka dot dresses Suzie Flood Kenny from Dublin used when she was tying the knot. This fab photo was taken by Katie Farrell Photography in Glengarriff, Co Cork, Ireland. So what is it about these dresses that will make you jump for joy? Is it the style? The colours? The prices? Or just the feeling you get when you are wearing them? As Rebekah Wright writes: "Had the best time being bridesmaid for my sister, this is a photo of me (right) & the other bridesmaid (Katie, left) jumping for joy!! The beautiful back drop is Culzean Castle in Ayrshire." There is a wide variety of dresses available at Lady V, there are classic patterns that we always have in stock, or there are some that are special editions, never to be seen again. All range from sizes 8 to 32. If you are looking to add some extra colour and style with your bridesmaid dresses then click here for the Lady Vintage look. Great post, thanks for share the valuable information related to bridesmaid dresses.